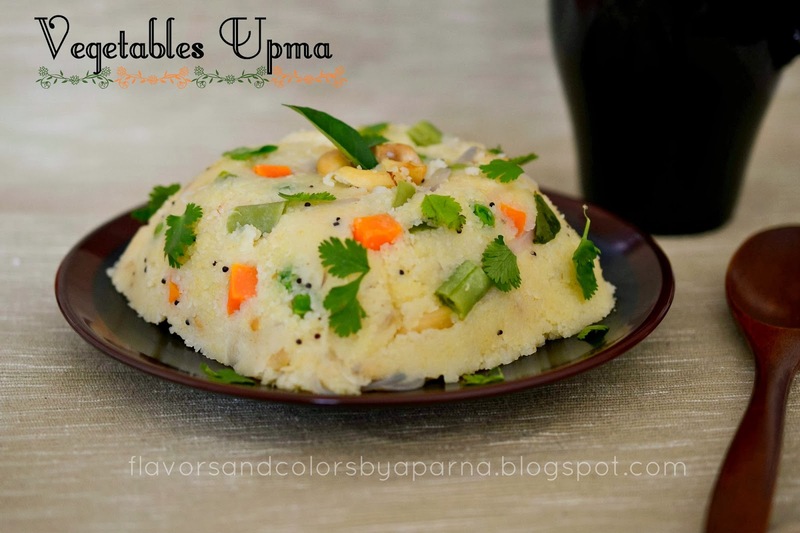 Upma or Uppittu was one amongst few easy dishes that I learnt to prepare in those beginning days of my cooking. This is a famous Indian dish made from semolina or suji/rawa traditionally served for breakfast. Rulavu is the name for upma in konkani. Rulavu with phova chutney/phovu and nylon sev is a hit breakfast combo prepared during festivals and religious ceremonies such as marriages/ engagements/thread ceremonies in a konkani household. The upma I tasted during my son's naming ceremony was best in taste till date. It was a plain one without any onions and vegetables but was so delicious that I had to check with cook [who comes from my native place] as what was his technique/ trick to prepare this plain yummy rulav and with a smile he answered in konkani language "Rulav [Semolina] layak kornu tuppantu bhaajuka ,, tupa [ghee] une korchya na ani udka [water] alte sama assuka ". What he meant is translated "The semolina needs to be roasted nicely in ghee on low flame, you should't limit the quantity of ghee [the health conscious mind of mine always tries to limit the use of ghee and hence I fail to follow this suggestion :P] and ratio of water to semolina should be correct". Boil 4 cups on water in a vessel. On another flame take 1 tsp ghee in a pan/wok and roast the rawa nicely on low flame until a nice aroma wafts over. Take care to prevent burning the rawa. Keep it aside and allow it to cool. In the same pan heat remaining 2 tsp of ghee. Add mustard seeds and wait for them to splutter. Next add urad dal and stir it till they turn light brown. Add chopped green chilies, curry leaves, broken cashew pieces and fry for a minute. Now add sliced onions and saute them till they turn translucent. Add mixed vegetables, salt, sugar and 4 cups of boiling water. Next add roasted rawa to the boiling water gradually while stirring it to prevent any lump formation. Wait till all the water is absorbed. Cover the pan, cook it on sim flame for 5 mins. Switch off the flame and garnish it with finely chopped coriander leaves and serve it hot with sev. You can also garnish it with grated coconut. 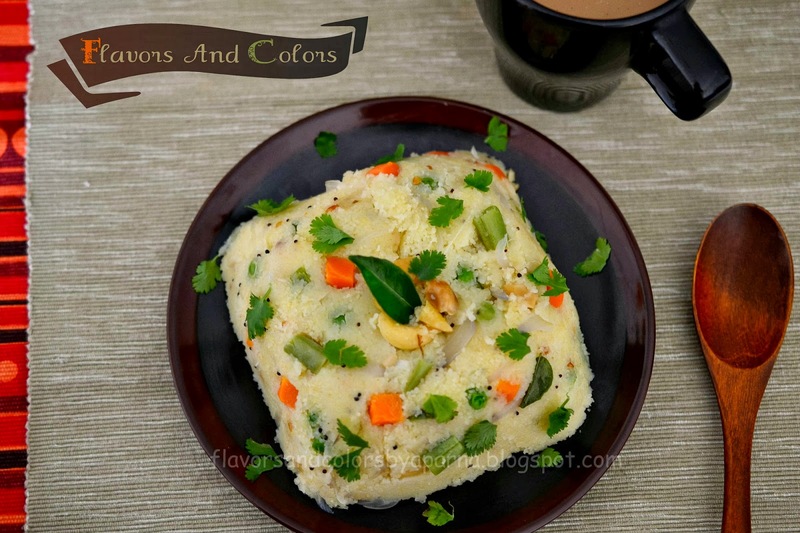 I prefer not to garnish with grated coconut when I use onions in upma. If you want the upma to be tangy you can add lime juice in the end. Those special days [festivals/ fasting days], I try preparing this from broken wheat and add ginger and grated coconut instead of onions. You can also serve this dish for brunch or as a snack with cup of tea in evening. 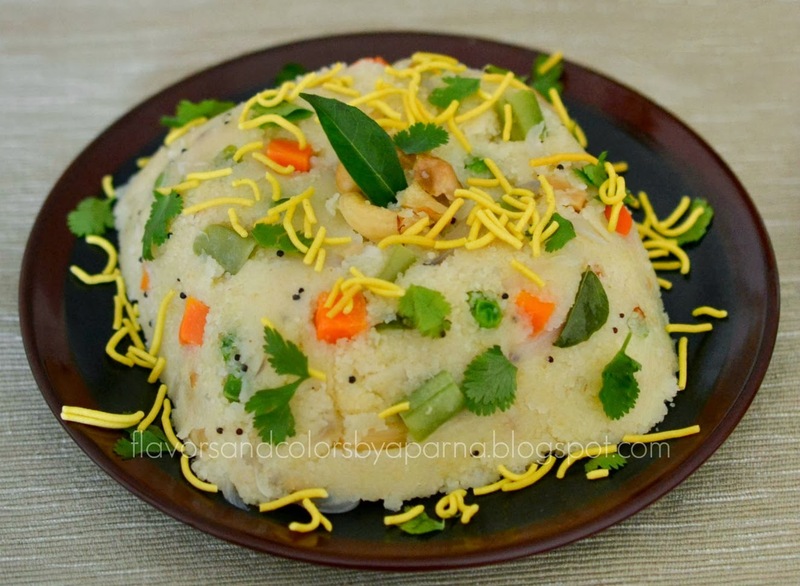 very healthy and tasty upma. so attractive it looks.. Glad to find a blogger from Karnataka.Happy to follow you .. would be happier if you reciprocate. Lets stay in touch..